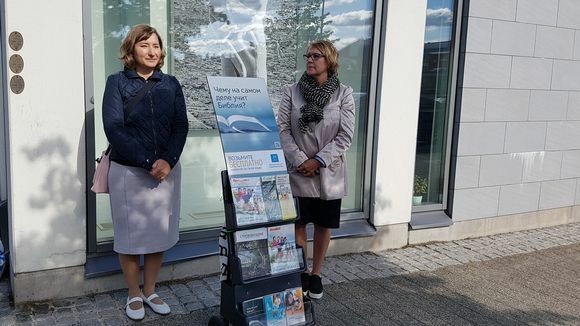 Some 200 Russian Jehovah’s witnesses are now residents at Finnish reception centres waiting to find out whether or not they will be granted asylum after the movement that preaches the Bible as the word of God was banned in Russia in 2017. Last year, around 100 Russian members of the Christian group crossed the border to seek asylum in Finland from what they characterised as religious persecution. Finnish officials said they expect their numbers to grow this year. But according to Juha Similä, who heads refugee matters at the Finnish Immigration Service, being a Jehovah's Witness adherent doesn’t automatically qualify as grounds for asylum. ”We consider an individual's position within the organisation, how visible their work has been, and whether they have been the target of arrests or violence,” he said. In the spring of 2017, Russia cracked down on Jehovah's Witnesses — which number some 175,000 in Russia — effectively banning them in the country. The state also shut down the group’s main Assembly Hall in St. Petersburg on the heels of implementation of the country’s new anti-terrorism laws banning foreign missionary work. Oleg Pisarenko says harassment escalated in Russia in 2016 when police shut down his sidewalk stand. Veikko Leinonen, a spokesman for Jehovah’s Witnesses in Finland, says Russia is abusing terrorism laws to persecute religious groups. Now in Finland, the Russian asylum seekers say they have set up their own Russian-speaking congregation while they await news from Finnish immigration authorities. The Sytshev and Pisarenko families say they’ve settled in at the Joutseno refugee reception centre in Lappeenranta, where many families are housed in the old wooden buildings that used to serve as living quarters for the correctional officers working at nearby Konnunsuo prison.